The argument for change in the fire service has been on-going for centuries. The overall behaviors of individuals and groups ultimately defines the culture of the organization. Individuals affect their environment every day which defines the current climate. Over time, a set of norms, beliefs, and values are adopted by the larger organization that defines the culture of the organization. In creating a positive culture, the identity of the group takes priority of that of the individual. An individual’s belief system is effected by the larger culture of the organization. So what is the outcome we are striving to achieve? 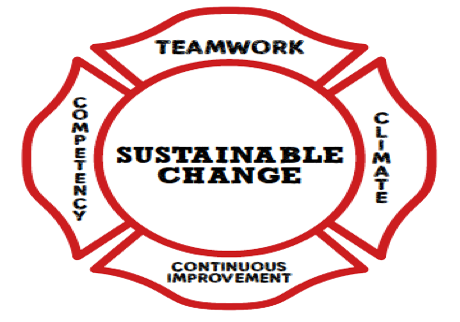 A fire service organization that supports a climate of teamwork where competency is required. The members understand that continuous improvement is the expectation with the goal of sustainable change. Click on infographic for full-size version. Fire service cultures are ever changing driven by internal and external forces. As fire service leaders, we espouse that the mission of the fire service is to provide a capable and motivated workforce, focused on community based preparedness and response to all hazard events while being adequately equipped and compensated. Building and sustaining a positive organizational culture is a constant journey that either will be trending up or trending down, it is not static. It requires the perspectives of a diverse workforce to adopt the identity of the group while embracing the mission. It is the collective people (firefighters, company officers, chiefs) that will make the transformational change process fail or succeed. The leadership compels the process by engaging, explaining and then setting expectations for members of the organization. If the expectations align within the beliefs and values of the membership, they are more likely to support change as long as accountability and enforcement procedures are implemented. A logical argument for change must be articulated while addressing a motivational aspect of why change is positive for the organization and the individual. Evaluating, developing, and implementing strategies to address political barriers is an important element as well as the limited resources that prevails in public safety organizations. Leadership styles of formal and informal leaders of the organizations impact the culture. 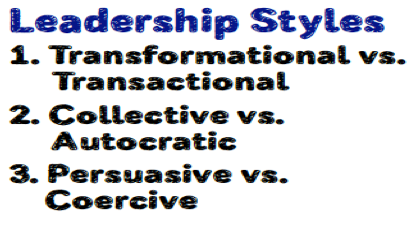 Autocratic, transactional, and coercive styles of leadership can stymie cultures where collective, persuasive, and transformational styles are enablers to developing and sustaining a positive culture. Understanding and implementing various leadership styles–dependent on the situation–is imperative while remaining authentic to who you are within the organization. When managing the change process there are two approaches to evaluate – a prescriptive approach where the process is the primary focus and a descriptive approach where the final outcome is the focus. We believe it is not an either or proposition. We propose that a blended approach is needed where the process is well defined and understood while flexible enough to adapt to an ever changing environment. A top-down, bottom-up or middle-out approach will likely fail to transform an organization. In a top-down approach, you can have the right solutions but if the workforce perceives that the process is biased they will likely fight the initiative, overtly and/or covertly. Bottom-up approaches take time, and it is likely perspectives will be adapted to the existing culture. Middle-out—where the Company Officers are the influencers—has been identified as the most important level and espoused in many publications on culture change in the fire service. Transformational change occurs when all levels of the organization of engaged. There are six common attitudes of those within organizations to understand. The theory of tipping point leadership advocates that leaders have to focus their attention on naysayers and champions. Those in the middle will follow the dominate force. By engaging those who oppose change-and providing support for those who will make it happen-organizational transformation can occur quickly. Sustainable change emerges when the naysayers become part of the solution and even converted to champions. Transformational change translated means what used to exist is now distinctly different. The fire service has failed the perception war with many of its external stakeholders who believe we are a legacy discipline that communities can no longer afford. Arguing that the fire service has evolved is not enough. 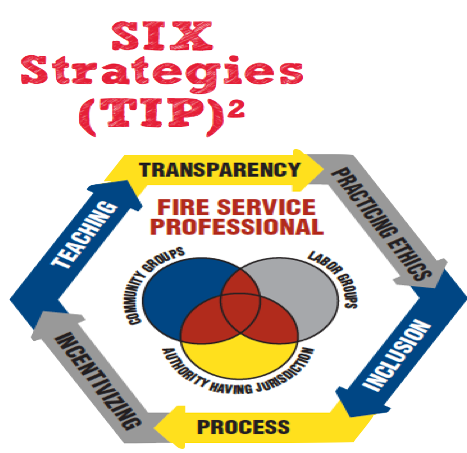 By formulating a firefighter value proposition where our capability, impact, proof, and cost become evident to our stakeholders, perceptions can be transformed. 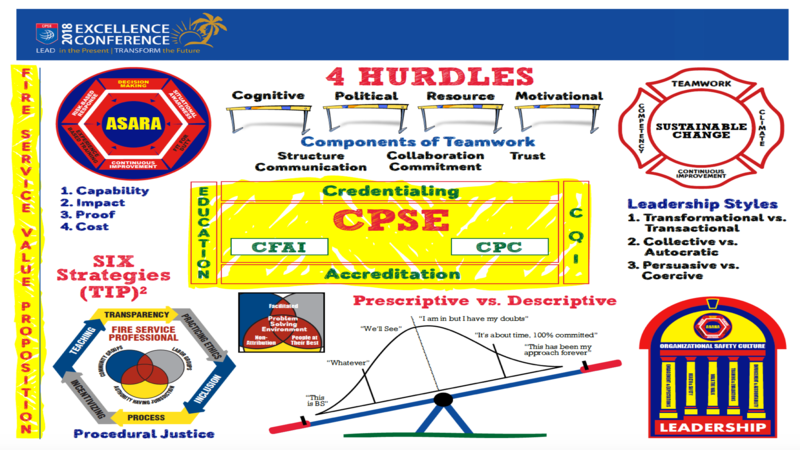 The CPSE model of credentialing & accreditation through education and continuous improvement provides evidence of our value. 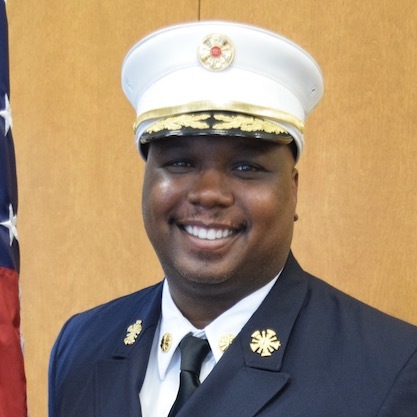 Reginald Freeman is the fire chief/emergency management director for Hartford, Connecticut and is chair of the Commission on Professional Credentialing Commission. Prior to this, he served as fire chief for Lockheed Martin Aeronautics in Ft. Worth, Texas. Chief Freeman also served in Iraq as a civilian fire chief for the U.S. Department of Defense from 2004 to 2008, providing all hazards fire and emergency services to forward and continuing operating bases throughout Iraq. His last assignment was as the Chief of Compliance, Safety, & Planning where he helped manage more than 700 firefighters. Chief Freeman holds a bachelor’s degree in Leadership from Bellevue University in Bellevue, Nebraska, a master’s degree in Executive Fire Service Leadership from Grand Canyon University in Phoenix, Arizona and is currently a doctoral candidate studying Organizational Leadership with an emphasis in Organizational Development. He earned his Chief Fire Officer designation in 2008. 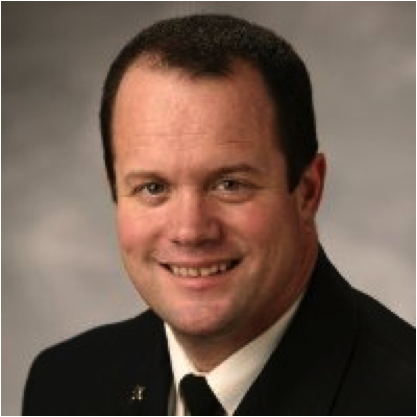 David Matthew is a seasoned presenter having delivered TEDx style presentations at the Executive Fire Officer Symposiums as well as other conferences and emergency response venues. David is a passionate & energetic presenter who strives to offer research based solutions while supporting debate about the future of the fire service. Chief Matthew has over 30 years of public sector experience; he has distinguished himself as one actively influencing public safety organizations and public service across America. His work history includes leadership positions as the Deputy Chief of Operations for the South San Francisco Fire Department and as a Division Chief for the Sedgwick County Fire Department. He serves as a subject matter expert for the Department of Homeland Security (DHS) developing and reviewing programs as well as supporting research efforts. He earned his Chief Fire Officer designation in 2006. Chief Matthew can be reached at dmatthew32@aol.com.